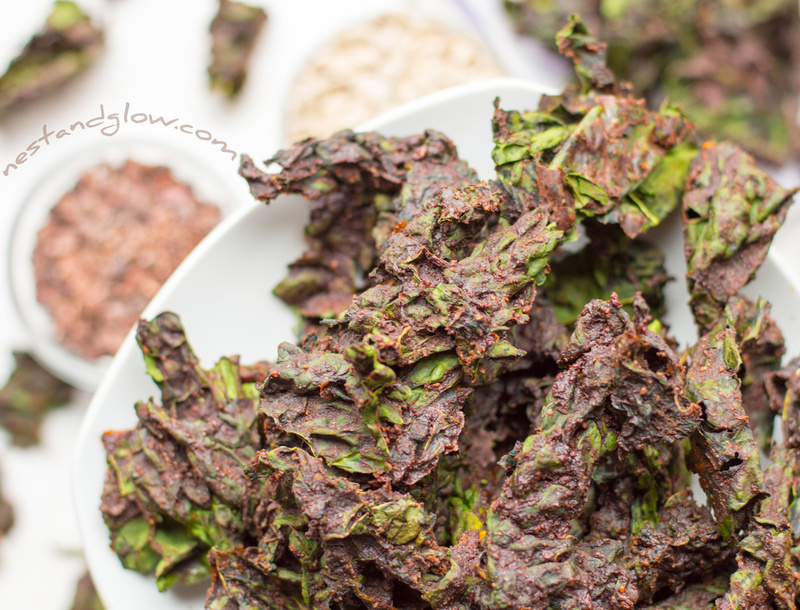 These chocolate dessert kale crisps are bursting with nutrition and full of fibre and protein. They are made with sunflower seeds so that they are inexpensive and nut-free. Sweetened purely with dates. The seeds are soaked in order to sprout and make the nutrients more bioavailable. Suitable for a vegan, plant-based, nut-free, paleo, grain-free, gluten-free and if you dry them slowly a raw food diet. 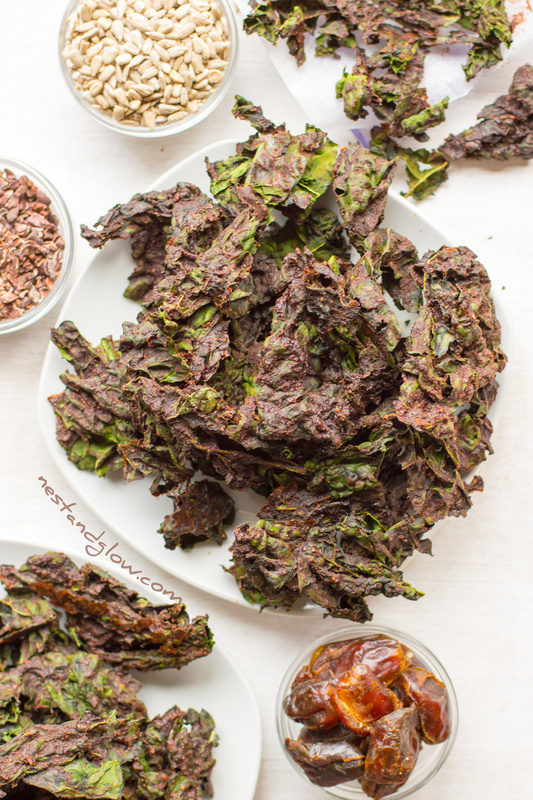 Chocolate and kale may sound odd but trust me it really works. Soak the sunflower seeds in water for at least an hour or overnight. Drain and rinse the seeds then blend with all the other ingredients apart from the kale, salt and oil. Rip kale off the stems then tear into bite-sized pieces and scrunch with the oil and salt until it halves in size. “Massage” in the sunflower chocolate paste to coat all of the kale evenly. You really don’t taste the kale in these, it’s just a crispy nutrient dense base to carry the flavours. Cashew nuts or any other nut can be used instead but I’m using sunflower seeds for some variation and to make it budget friendly. Dates are used purely to sweeten, I’m just using bog standard dried dates without anything added. Just make sure to check that all the stones have been removed. The oil is optional, it just helps give a more chip-like texture and taste. Always use a cold pressed virgin oil like extra virgin olive oil. I’m using raw cacao powder for these as it has a deeper chocolate flavour. But cocoa powder also works well but does yield a slightly different taste. If you don’t like dates then you can use any other dried fruit (like raisins) or natural sweetener that you like. I have a food dehydrator as I was into the raw food diet about 15 years ago and my expensive purchase back then is still in working condition. 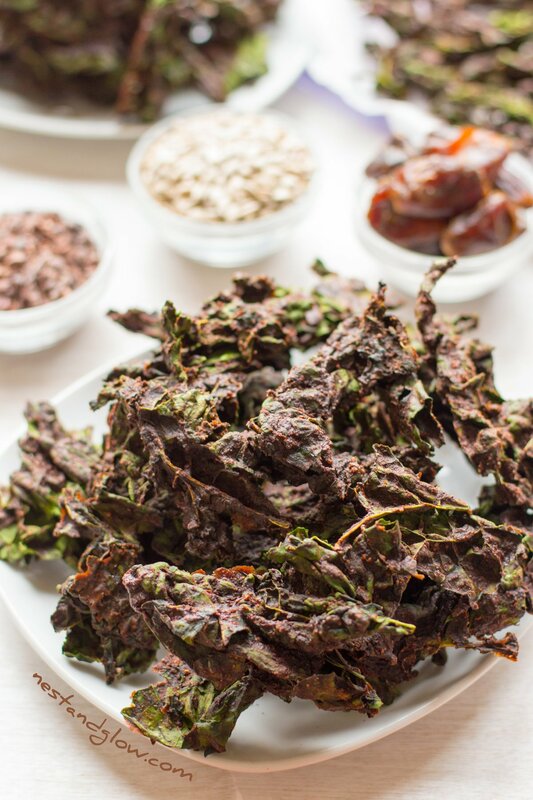 My food dehydrator is mainly used for kale chips as its full proof to make them, just pop them in before bed then enjoy the next day. Obviously most people don’t have a food dehydrator and these also work in an oven – you just need to watch carefully as they burn easily. 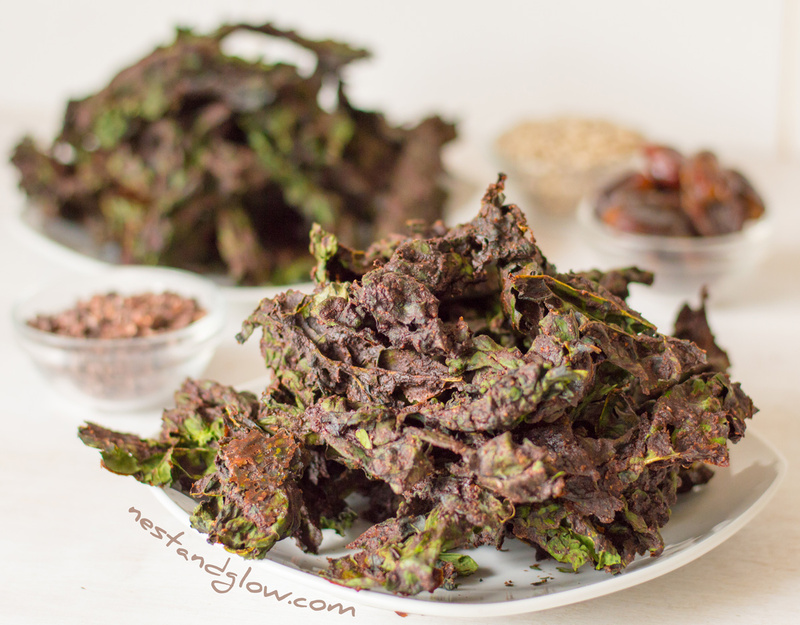 If the kale chips become soggy then place back in the oven or dehydrator for a short time to crisp up.